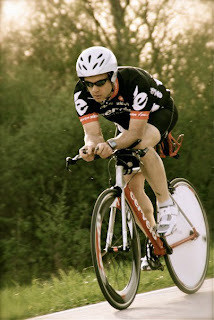 I know my friend Mike Bernico as a "tough-as-nails" triathlete who lives a well-rounded lifestyle and is training for his first iron-distance triathlon this year. He's been in the sport for a little while now, and he is definitely ready to KILL this race in September! He gives it to his readers straight-up. He takes a no-excuses attitude. When Dan and I were reading what he wrote about "Personal Responsibility" our jaws dropped and all we could say was "bad-@SS." So head on over to his blog; it might save the life of you or someone you care about. I am heading over there right now. Sounds like an amazing story! You're an important part of the story too. If I hadn't had your help I'd probably still be under fueling and suffering the consequences of that! Going to go check out his blog right now. Thanks Laura! Laura, that is an amazing story. I had to come back and say thanks for pointing me that way. Very cool. I have a friend going through a similar journey (not 400 lbs but has lost 100 so far and doing his first tri this summer!). Thanks for the link! !